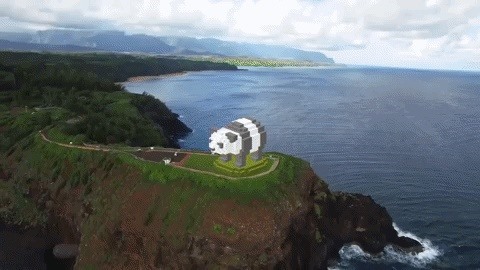 If DroneBase's new AR platform inspires even half the creativity among its users as Minecraft did with its community, then drone pilots are about to enjoy acres of blocky worlds to explore among the clouds. That new platform is called AirCraft, and it's available as a beta feature in the latest update of the DroneBase app via the iOS App Store (with an Android version forthcoming). 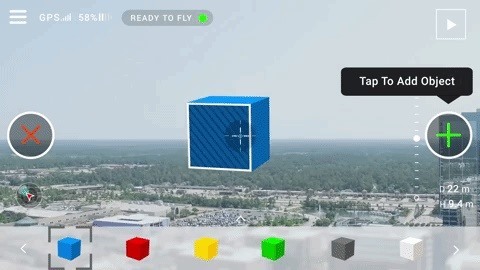 AirCraft enables drone pilots to build their own 3D structures in the sky through their vehicle's camera view. Like Minecraft, the app provides users with colored and textured blocks with which to build. "AirCraft gives pilots of all skill levels new reasons to fly their drones," said Dan Burton, co-founder and CEO of DroneBase, in a statement. "Unlike current AR experiences, AirCraft allows pilots to create and interact with virtual objects in the sky while flying. We're looking to our community of pilots to see what they will build, how they will use this technology, and what they want next." The app offers endless possibilities, such as building obstacle courses and recreating works of art. The platform is collaborative, too, as users can discover objects placed by others and even contribute to those creations. Of course, users can also capture photos of their creations to later share with others. "Drones help us interact with the world in completely unique ways, and the features offered by AirCraft expand on this interaction in a way that I've never seen done before," said George Garcia, a DroneBase pilot from New Jersey who participated in testing for AirCraft. "From simply making fun objects in parks and on mountains to making additions to large structures, AirCraft is both enjoyable and practical." But the app isn't just all fun and games. DroneBase believes that AirCraft can be helpful in visualizing construction projects, particularly when using the blocks with building material textures. A minimum of iPhone 6 or iPad fifth generation is recommended to run AirCraft; older devices may suffer from reduced performance. Likewise, compatible drones include DJI Phantom 3, Inspire 1, or an "equivalent/better drone" with the ability to capture geotagged, 12-megapixel images with accurate latitude, longitude, and altitude coordinates. DroneBase joins a cross-section of companies, including Epson and Edgybees, taking advantage of the growing intersection of emerging technologies like AR and drones. The Federal Aviation Administration estimates that seven million drones will occupy the friendly skies by 2020, while market analysts like ABI Research project that revenues for augmented and mixed reality technology will exceed $95 billion by 2021.